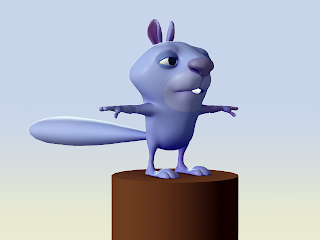 I got Mr. Squirrely's texture done and started needlessly playing with some mental ray subsurface scattering and ambient occlusion. I gave fur an attempt but it just takes too long and I don't wanna mess with it. So there. 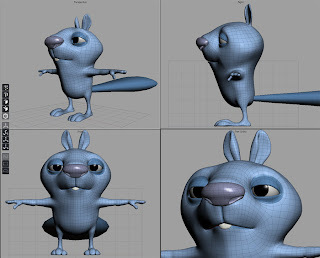 Started blocking out Squirrely a couple of days ago and put some more time into him tonight in ole' Silo. That's not his real name, but it works for now. My modeling skills needed some exercise anyway while I wait on some crits from Bokser for my latest blocking on a shot. I'm sleepy and it's midnight. That is all. 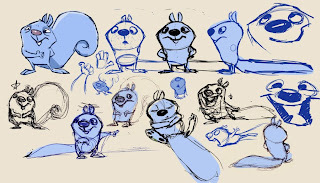 Larry Lauria was my first traditional animation teacher at SCAD and grounded me in the basics. He's just releasing a new set of classes partnering with Digicel Flipbook (which still finds a place on my desktop). 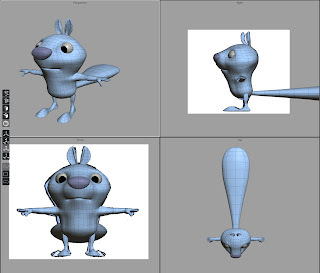 It looks like the basis of the Introduction to Animation I had with him back in the day and it was a great class then. Check it out if it floats your boat (not too pricey either). Dan Paladin (what a sweet name, eh?) is an amazing illustrator and animator for that matter and I can't wait for Castle Crasher's to release. In the meantime here's some great workflow vid from him. Comic-Con 2008 Flag Design from The Behemoth on Vimeo. Been working some on Bokser's film and enjoying that. I can't wait to get past blocking and into animating after the assets are finaled. In the meantime, I think it's time to get some back to the basics exercises going. Updated jbExportQss - Got some insight from a poster on Cgtalk and adds some new abilities and squashed some bugs. Still available here. After this one, I think I'm done mel scripting for a while...my brain hurts. Andrew Stanton Podcast - A nice long interview with the director of Wall-E and Finding Nemo. Big MacGuffins - I had never heard this term but this was a great introduction to it and an insightful pose. My meager education in storytelling continues. Another Episode of Simon's Cat - I love these. Some amazing concepts - Check out the work of Harald Siepermann.